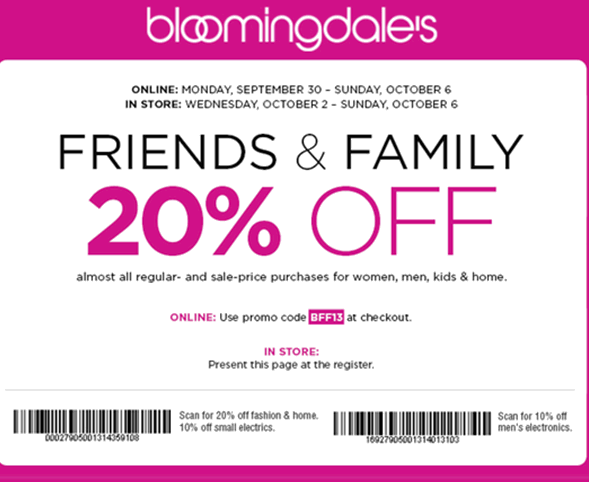 Gotta love the annual friends and family coupon code for Bloomingdales.com! Use coupon code BFF13 to get 20% off your order online Mon Sept 30-Sunday October 6th. Print out the coupon below to use it in-store Wed-Sunday. Dealhack sent a coupon code to my email. I redeemed it on Bloomingdales while purchasing the clothes and got a good discount. Thanks.